My take on Volkl's Nunataq is that it's exactly the ski it's supposed to be. Billed as the touring version of the Gotama (or so Volkl told me), the Nunataq does indeed deliver a Gotama-reminiscent ride at a tour-worthy weight. The Nunataq is aimed squarely at the jugular of today's North American backcountry market: take a look at that fat 107 millimeters underfoot. Clearly, this is a powder-tilted ski, built for that ever-expanding group of skiers who've discovered the perks of human-powered climbing to find endless fields of untracked fresh. Skis in this niche need to delicately straddle the twin worlds of Alpine expectations (solidity, feel, performance on hard snow) and Backcountry realities (light! light! light!). It's not easy to get this balance right. Often, skis end up skewing one way or the other, or, worse, neither. How does the Nunataq do? Very, very well. Unfortunately my ability to test the Nunataq in soft snow was limited, but I'm going to make a wild guess here and say that the rockered, 107mm-waisted Nunataq won't leave you grumbling in powder. Where I was able to ride the Nunataq was on hard snow and late-in-day chop and wash.
What leapt out a me instantly was how well balanced the ski is. "It feels like a ski," I said in my on-the-hill comments, which isn't meant as a joke. A lot of skis in this sort of cross-over category end up feeling weird underfoot. They have flex and turn shape characteristics that just never come to feel natural, no matter how much you ride them. Stand upright and roll your ankles side to side, and the Nunataq predictably arcs turns back-and-forth, just like a ski is supposed to. A little edge turns into a little grip, with progressively more bite as you increase the angle. Stand centered on the ski, and it rounds out its turns with perfect manners. Get a little more forward for a slashier feel. All of it will strike you as perfectly natural, which really is how the best skis in this category are starting to ride, now. In these evolved, current-generation rockered skis, weirdness and strange mechanics have been replaced with exactly the on-the-snow feel we all grew up loving, now enhanced rather than replaced with rocker. I'm going to say on hard snow that heavier skiers will absolutely be able to overwhelm the Nunataq, which is, to be fair, significantly lighter than its cousin the Alpine/All-Mountain Gotama. 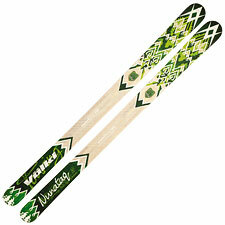 But this is a backcountry ski, at a quite reasonable 7.9lbs per pair, so I don't see that as a liability. At this weight, a lot of us will be tempted to ride this as a one-size-fits all backcountry plank. Ultimately, Volkl's Nunataq goes a long way toward bringing the feel of an Alpine ski into the backcountry, and that remains sort of the holy grail of the category. For this much area, plus natural and balanced rocker, the Nunataq really is exactly the ski it's supposed to be. I'll try to spend more time on it in mixed and difficult snow, but I'm already going to give it a recommended.